The next-generation DVD format war is over, and the future is Blu-ray. Ever since the two rival high definition DVD systems were launched in 2006 - Sony's Blu-ray and Toshiba's HD DVD - there could only be one winner. In a re-run of the VHS and Betamax video cassette battle of the early 1980s, each raced to win over both the home consumer and the big Hollywood film studios. Toshiba's announcement that it is to stop production of HD DVD players leaves the way clear for Blu-ray to become the industry standard. Yet how did Toshiba fail while Sony succeeded? It is a story of computer game consoles, marketing savvy and schmoozing in Los Angeles, as well as Sony's determination not to let history repeat itself. Which, at the end of the day, all boils down to much higher sales figures for Sony. The first factor that needs to be put completely to one side is picture quality. Unless you are a technology geek with a television the size of a multiplex cinema screen, there is no difference between the output of HD DVD and Blu-ray machines. Both offer high definition DVD playback superior to standard DVD players. Where Sony had the killer edge is that its Playstation 3 (PS3) computer games console comes pre-fitted with a Blu-ray player. 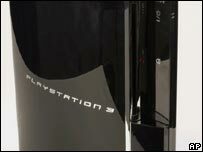 So as Sony has sold 10.5 million PS3 consoles since it was launched in late 2006, that is 10.5 million Blu-ray machines already in homes around the world, before you add sales of stand-alone Blu-ray players. By contrast, Toshiba has sold only one million HD DVD machines. Toshiba does have a tie-up with Microsoft's Xbox 360 games console, but Xbox users are required to buy an external HD DVD drive. And as Toshiba's one million sales figure for HD DVD machines also includes shipments of these drives, it appears that not many Xbox owners have been bothered to go to the additional expense. Sony also had a head start over Toshiba in persuading the big US film studios to back Blu-ray - its own Sony Pictures is one of the main players in Hollywood. Walt Disney and 20th Century Fox joined Sony Pictures in supporting Blu-ray. And although Paramount Pictures, Universal Pictures and Warner Bros initially decided to back HD DVD, Warner Bros switched sides last month. 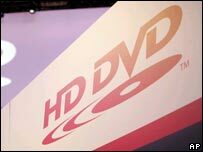 For many analysts, this was the final nail in the coffin for HD DVD. "When Warner made its decision, it was basically over," says Kazuharu Miura, an analyst at Daiwa Institute of Research in Tokyo. Key US DVD retailers Target and Blockbuster have also decided to go with Blu-ray. Other analysts also point to Sony's better marketing campaign for Blu-ray, fuelled by its determination not to lose a format war that brought back painful memories of the defeat of its Betamax video format by the JVC-developed VHS. Is HD DVD going to go the same way as Betamax? Although Betamax offered better picture quality, VHS machines were cheaper and quickly gained the majority of market share, eventually killing off Betamax. It appears that Sony spent many years analysing that defeat and this time around, it was much better prepared. Putting a Blu-ray player in each PS3 was the secret weapon to ensure the format's presence in customers' front rooms around the world, effectively making their choice of high definition DVD player for them. While Toshiba's decision to end the production of HD DVD players is undoubtedly a humiliation for the company, analysts say it will be good for the firm's profits. Goldman Sachs estimates that the move will boost Toshiba's profitability by up to 40bn yen ($370m; £190m) a year. "The potential losses are small compared to the savings," says Goldman Sachs analyst Ikuo Matsuhashi. Commentators also point to the fact that as consumer electronics is such a small part of Toshiba's business, it could afford to lose the format battle. For while finished electrical goods such as laptops, DVD players and televisions make up just 6% of Toshiba's profits, it makes 40% of them from the sale of computer chips and a similar proportion from its nuclear power operations. By contrast, consumer electrical goods have always been core to Sony's profits. But what does it all mean for consumers? "It's good for consumers, some of whom must have been resisting buying next-generation DVD recorders because of the two incompatible formats," says Hiroyuki Shimizu, an analyst at IT research company Gartner. "If there's only one format, consumers don't have to worry about incompatibility." Yet while Mr Shimizu predicts sales of Blu-ray players and discs will now take off, other analysts say the format battle is meaningless. They say this is because a growing number of consumers are already turning their backs on DVD players to download their movies via the internet instead, or from their satellite or cable television provider. Adding that electronics companies are wrong to assume that viewers want ever better picture quality, they point to the failure of high fidelity music formats Super Audio CD and DVD-Audio in the face of the explosion in the popularity of music downloads. While typical digital music formats such as MP3 have reduced sound quality compared with even standard CDs, their convenience has more than won over consumers. 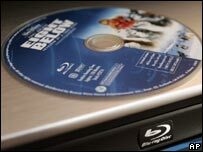 The future of high definition DVD players may very well be Blu-ray, but whether they can make a dent in the face of the growing march of computer downloads is quite another story.